Gracious speech is kind and shows courtesy. It is pleasant and sweet. 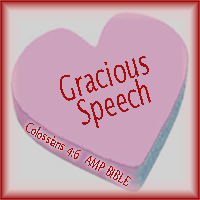 Dear Lord, today I want to focus on speaking graciously. I want to season my words with salt, so as to preserve them in people’s minds that they might cause a thirst for the truth of the gospel. I want my speech to be gracious so that it might cause people to ask me about my faith and thus give me an opportunity to share the good news of the gospel with them. Anyone who loves a pure heart and gracious speech is the king’s friend.